A photo taken today at York’s art gallery, which is about to close for years, for major refurbishment. 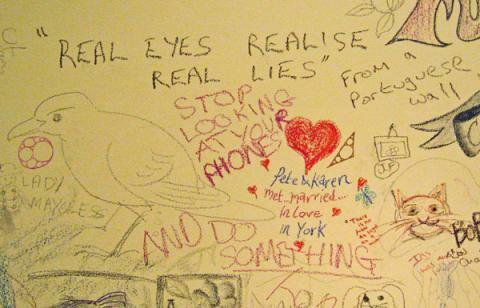 Before its refurbishment, an open day, which encouraged people to write on its walls. More on this story later. For now, my favourite bit of the many contributions. I’ve been busy doing another overhaul of these pages, ironing out a couple of ‘issues’ (or as we used to call them, ‘problems’). There are hundreds of pages on this website, and my visitors are now using hundreds of different devices to look at it. It may be a disjointed shambles at present. I’m doing my best to make sure it all fits back together, while using one arm to pat myself on the back for keeping it online for nine years – yes that’s nine years (trumpet fanfare please). By Lisa @YorkStories • 2 February 2013 Web/website matters To link to this page's proper location please use the > permalink.